John Borstel describes himself as an artist working at the crossroads of photography, performance, and text. His mother was a fiber artist and his father an editor; both parents were writers. He traces his artistic practice back to their influence and to the dress-up games he played as a child. Important teachers, encompassing visual arts, photography, performance, writing, and creative process, have included Daniel Brush, Karen Keating, Tom Wolff, Arno Raphael Minkkinen, Mark Power, Sally Nash, Celeste Miller, Regie Cabico, Devora Neumark, Pam Hall, Peter Hocking, and Liz Lerman. After pursuing self-imaging photography for over 20 years -- finding an audience by mailing Valentines and launching a website -- he began showing his work in gallery settings in 2004. Since then his award-winning work has been displayed in galleries throughout DC/Baltimore area and as far afield as New Mexico, England, and Israel. John is currently working as an independent consultant following a 20 year career in programming and development for Dance Exchange, a nationally-touring contemporary dance company founded by MacArthur “Genius Grant” recipient Liz Lerman. 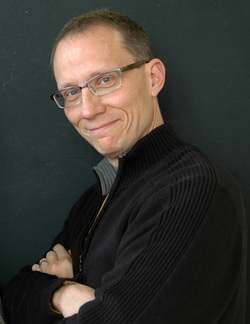 He is co-author and illustrator of Liz Lerman’s Critical Response Process and has traveled widely to teach and facilitate this unique feedback system, which emphasizes the values of dialogue and active involvement by the artist. At other points in his checkered career John has been a puppet-maker, the art director of two veterinary journals, and a singing usher. John is an active blogger and published writer on arts practice and has served on numerous governing and advisory groups. He teaches at Photoworks Glen Echo, where his specialties include text/image synthesis and creative process for photographers. John holds a B.A. in English from Georgetown University and an MFA in interdisciplinary arts from Goddard College. Born in Baltimore in 1957, he now lives in Silver Spring, Maryland, with his partner of over 25 years.